An anonymous letter from the Catholics at Father.Themann.Answered@gmail.com. We are writing about your Society’s India publication called “The Flying Squirrel”. You are responsible before God for what goes on in your Society. Although you do not read all SSPX publications before they are distributed, you have the responsibility and power to choose who writes them. You have the responsibility and power to publicly correct scandals and publicly punish those committing them. 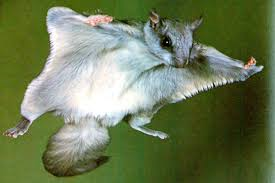 recently caused in most English-speaking countries by The Flying Squirrel, here is your chance. Your Society’s Flying Squirrel has been circulating on several continents. your Society’s Flying Squirrel, because you have yourself been leading your Society into the liberalism of which the Flying Squirrel is merely a manifestation. SSPX think that a Catholic name lacks the “freshness” and contemporary “feel” evoked by an irrational animal? On pages 2-3, your Society’s Flying Squirrel publishes a complete sermon of Pope Francis. Why is that? Could your Society find nothing more edifying and orthodox than this? Could your Society find nothing from any source, which was not tainted by the pope’s humanism and liberalism?
. Your Society makes no comment about these scandals and evils. the outskirts”, but not take “isolated paths”. The pope preaches human service. This fits with his social worker agenda. Flying Squirrel shows its solidarity with the pope’s humanism, by its masthead motto: “Love brotherhood”. Your Society’s publication of Pope Francis’ sermon includes the pope’s praise of Fr. Pedro Arrupe, the heretical advocate of liberation theology. With the pope’s inexhaustible series of grave scandals and errors, how can you say (as you do) regarding Pope Francis, that it is “difficult to arrive at a judgment about his words”? Besides Pope Francis’ sermon, your Society’s Flying Squirrel contains a two-page “meditation” from the thoroughly-conciliar so-called “Catholic”, Kathleen Finley. This is syncretism and ecumenism! The SSPX is here promoting the vocabulary of yoga, eastern paganism and the New Age! The “meditation” which the SSPX is promoting here, is directed generically to the “Creator”, so as to offend no one. The request made to the Creator, is to “experience” Him. This experiential religion is the heresy of immantism and is rank Modernism. See, Pascendi, St. Pius X, §14. together is something very special and a sign of a bright future”. Your Excellency, why doesn’t your Society spend more time condemning the errors of heretics and pagans, and reminding readers there is no salvation outside the Catholic Church, instead of promoting Opus Dei’s works of interreligious harmony? Your Society’s Flying Squirrel contains a naturalistic, politically correct article about gender discrimination and the human rights violations of infanticide against baby girls. This article relies on analysis by the “director of a Jesuit centre for human rights” and is full of jargon such as the condemnation of India’s “patriarchal outlook”. The article laments that women do not often “become professionals or reach important positions”. contains an article about India’s lack of religious freedom, resulting in the persecution of a “Pentecostal” minister for attempting to “convert” a woman to join his (heretical) sect. This article misleadingly makes it look as if religious liberty for heretics is a good thing, whereas it is an error of Vatican II. contains an article rejoicing that the conciliar church in India now has a new radio station, through which it can promote its conciliar errors. contains an article promoting a conciliar cardinal who erected a statue of Mary depicted in Indian attire. The article characterizes this statue as a “masterpiece of inculturation”. This cardinal is accused of seeking converts for the Catholic Church and he denies this accusation. The article then adds the commentary of a conciliar priest-sociologist who defends the Catholic Church as a protector of the human rights of indigenous people. Lastly,the article says that although Indians have different religions, they are unified by culture. contains an article promoting the conciliar bishops of India for joining with government and secular groups to give humanitarian aid to Hindu pilgrims. laws of God or the teaching of the Catholic Church, in this article concerning many millions of abortions, sterilizations and ubiquitous artificial contraception. Your Society’s Flying Squirrel contains an article about the lack of religious freedom and toleration in India. It contrasts the views of a Hindu leader, with the pluralistic opinions of the president of the “Global Council of Indian Christians”. other sacred writers. For example, St. Thomas Aquinas taught: “The Jews therefore sinned, as crucifiers not only of the Man-Christ, but also as of God.” (‘et ideo Judaei peccaverunt, non solum hominis Christi, sed tamquam Dei crucifixores.’). Summa Theologica, IIIa, Q.47, a.5 ad3. the Mother of God, viz ., she is the Mother of God because she is the mother (in His humanity) of a Person Who is God. The Jews committed deicide because they killed (in His humanity) a Person Who is God. Thus, they are God-killers – they committed deicide. The Flying Squirrel and the rest of the new SSPX remind us of some recent corporate history in the automobile business. GM (the large auto maker) owns the brand name, Oldsmobile. GM felt that the world had left behind the Oldsmobile brand. GM felt Oldsmobile’s only chance of survival was to update the brand to make it more contemporary, more youthful and more appealing to modern tastes. Incidentally, Oldsmobile went out of existence not many years after departing from its corporate “traditions”. Wow! This is "Traditional"? The writers of the letter retain the Catholic Faith, but fail to see that Antipope Francis has abandoned it. The cause of the errors, heresies and scandals is the failure to reject him wholesale and give up any/all ideas of being engulfed and destroyed by the Vatican II sect. Hopefully, the writers will, like a flying squirrel, leap out of the SSPX and its mad desire to become part of Antipope Francis, and join True Traditionalists in sedevacantism. Anyone who would stay in such an environment would have to be nuts---the perfect subjects to be consumed by the SSPX's Flying Squirrel. OK, but Fr Pfeiffer did seek to use Novus Ordo Church premises during his recent visit to India with Bishop Williamson, and was thwarted in some instances. Didn't know much about the SSPX until recently.Personally,I am very blessed to have a true catholic church within 30 minutes of my house.We are independent and unlike the SSPX,we do not argue, fight, create division,nor do we pretend to have complete authority over what's left of the true catholic faith.Their message boards are like hostile snake pit.Please pray for the SSPX and all traditional catholics.We need each other during this crisis.The last thing all of us need is more hate and confusion.